CO 92 sts. Knit 8 rows. Row 2: K4, P across to last 4 sts, k4. Row 1 (WS): K4, P2, *K4, P4, repeat from * across to last 6 sts, P2, K4. Row 2 (RS): K4, YO, ssk, *K4, P4, repeat from * across to last 6 sts, K2tog, YO, K4. Rows 3 & 5: Repeat Row 1. Rows 4 & 6: Repeat Row 2. Row 7: K4, P2, *P4, K4, repeat from * across to last 6 sts, P2, K4. Row 8: K4, YO, SSK, *P4, K4, repeat from * across to last 6 sts, K2tog, YO, K4. Row 1: K4, P across to last 4 sts, k4. Row 2: K4, YO, ssk, *YO, K2tog, repeat from * across to last 6 sts, K2tog, YO, K4. Row 3: K4, P across to last 4 sts, K4. 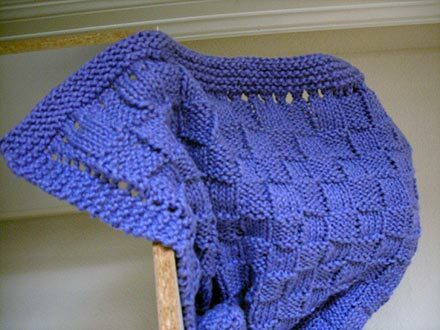 Knit 8 rows. BO. Weave in loose ends, block if desired. ©Melissa Leedom.